Alerting Infrastructure! 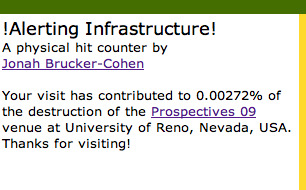 – 2003 | JONAH BRUCKER-COHEN, PH.D. Alerting Infrastructure! 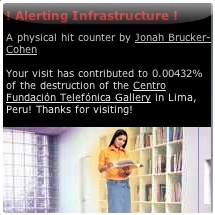 – 2003 – JONAH BRUCKER-COHEN, PH.D.
A web site Hit Counter that Destroys a Building. Alerting Infrastructure! is a physical hit counter that translates hits to the web site of an organization into interior damage of the physical building that web site or organization represents. 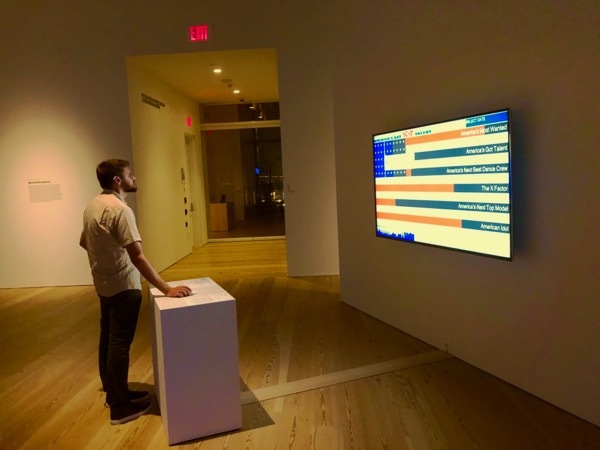 The focus of the piece is to amplify the concern that physical spaces are slowly losing ground to their virtual counterparts. The amount of structural damage to the building directly correlates to the amount of exposure and attention the web site gets, thus exposing the physical structure’s temporal existence. The project has been active in 11 countries (Ireland, United Arab Emirates, Peru, France, Brazil, USA, Spain, Canada, Belgium, Germany, The Netherlands) to date. 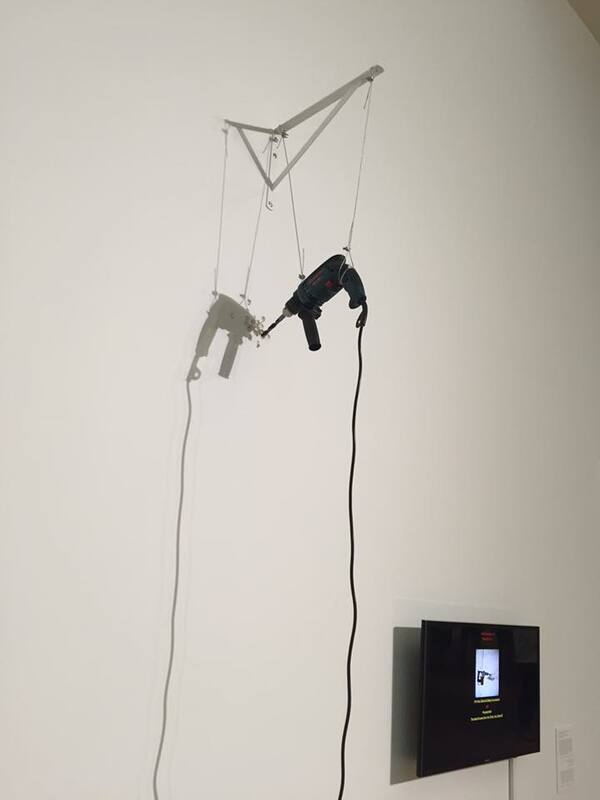 T.B.D, September 6 – October 26, 2014, Museum of Contemporary Canadian Art, Toronto, Canada. 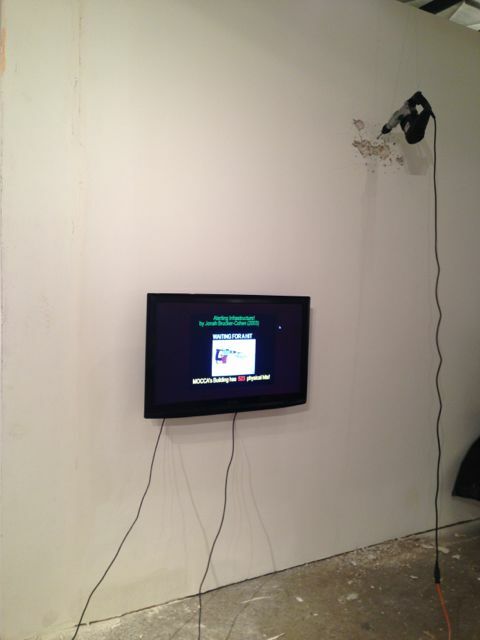 Social (DIS)Order, September 5 – October 7, 2012, Glassell Gallery, Louisiana State University, Baton Rouge, Louisiana, USA. ReFunct, Irish Museum of Contemporary Art, 8/09, Dublin, Ireland. ARCO Art Fair, 2/11/09-2/16/09, Madrid, Spain. Art.Mov Festival, 11/21/08-11/25/08, Belo Horizonte, Brazil. BLIP! @ Telefonica Foundation Gallery, 11/17/07-12/24/07, Lima, Peru. Interactive Media Arts Laboratory (IMAL), 10/4/07, Brussels, Belgium. Labcyberspaces Project, 3/30/07 – 6/30/07, LABORAL Centro de Arte y Creacion Industrial, Gijon, Spain. Texelectronica, Fort Worth Modern Art Museum, 10/26-28/06, Dallas, Texas. Garage Festival 2004, 7/23/03, Straslund, Germany. Haunted Exhibition, 9/22/03, City Arts Centre, Dublin, Ireland. The proliferation of web sites as virtual representations of physical locations has reached a saturation point. Despite the massive surge of bricks and mortar spaces (such as schools, businesses, organizations) maintaining online presences, there is still little connection between the people simultaneously inhabiting these spaces. Alerting Infrastructure! 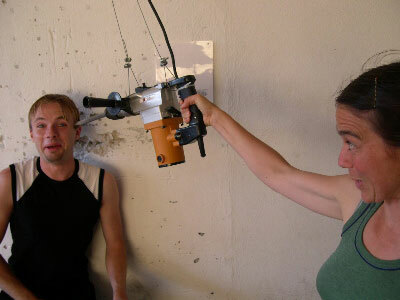 addresses this by connecting a physical space such as a building to its online counterpart or web site that represents this structure / organization by scanning access logs of web site for new unique visitor “hits” and translating each new site hit into physical output in the form of activating a large, pneumatic jackhammer. 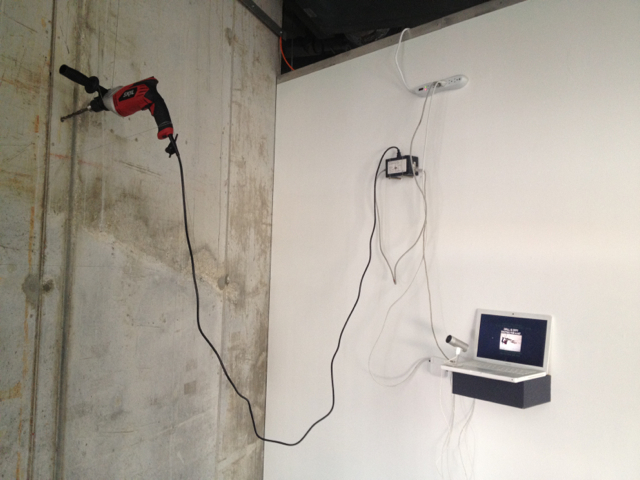 Video of the project installed at the Irish Museum of Contemporary Art, 7/2009. 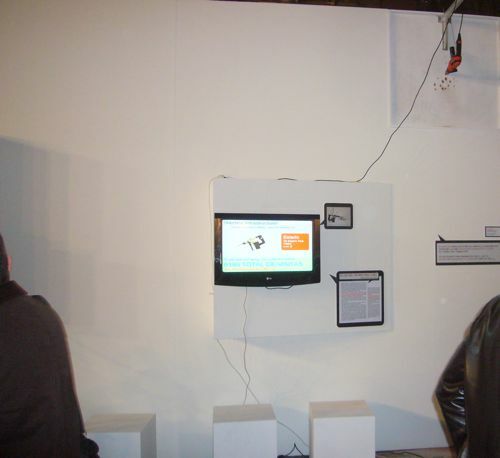 Video of the project installed at the Gamerz Festival, 11/2015. Alerting Infrastructure! drill @ Interactive Media Arts Laboratory (IMAL), 10/4/07, Brussels, Belgium. 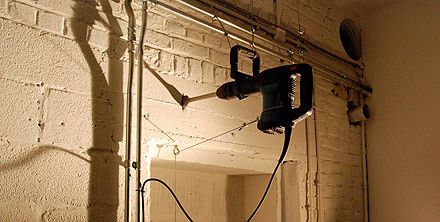 With each new virtual hit, the jackhammer slowly destroys the walls of the physical building. 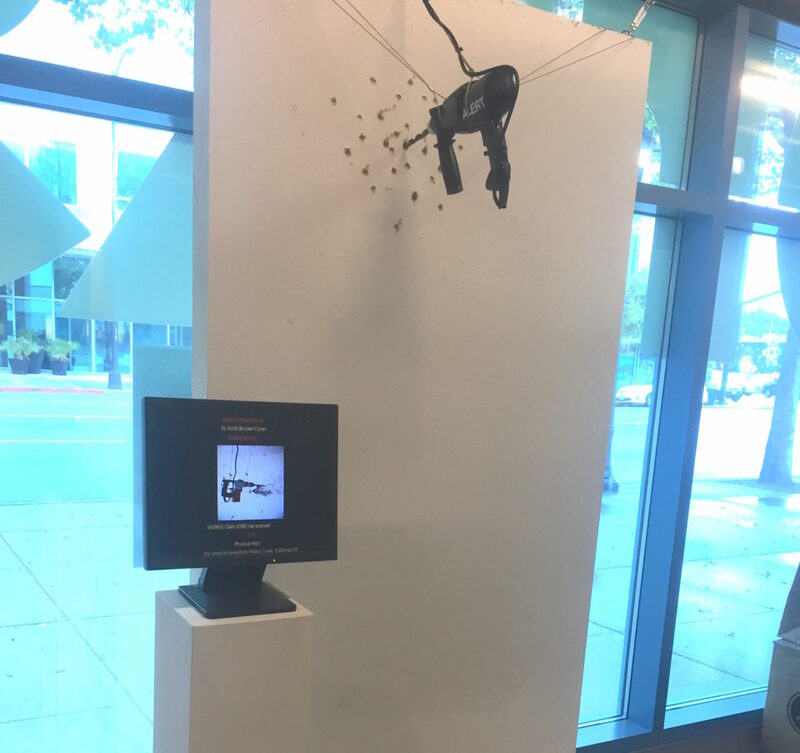 Since web sites and virtual interfaces can garner an almost unlimited amount of “virtual hits” without showing any visible signs of decay or extended use, the project attempts to illustrate a fundamental reversal in role of physical spaces losing importance and relevance to their virtual counterparts. Alerting Infrastructure! gains inspiration from other works that attempt to emphasize the temporal nature of physical structures and the social impact their inhabitants bestow upon them. One such work is Chris Burden’s Samson (1985), a mechanical structure of wooden beams set up so that when people enter a room through a turnstile, the beams are forced against the wall, eventually leading to the room’s collapse. 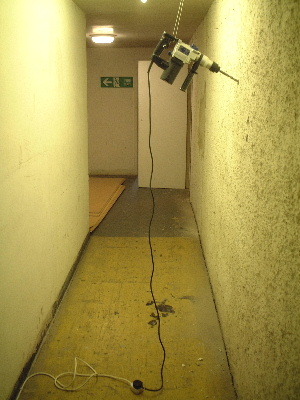 This installation not only instills fear in the gallery visitor (because the walls could collapse at any moment) but also makes them question the fundamental relationship between the structure and the space it occupies. 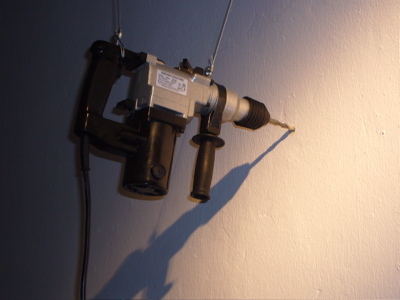 Similarly, the “Mural” robotic drill (designed by HoneyBee Robotics) from Diller + Scofidio’s exhibition at the Whitney Museum of American Art in NYC, drills randomly placed holes in the wall of the gallery as visitors entered the space. The sound not only disturbs the pristine acoustics of the gallery but also reminds visitors of the temporal nature of the structures holding up and displaying the work. Looking at the fundamental relationship between architectural space and its occupation, use, and subsequent decay over tiime, Alerting Infrastructure! is ultimately concerned with the potential role virtual participants can take in this process. In most cases, online visitors to an organization’s web site have no contact with the general public that is simultaneously inhabiting the physical space. 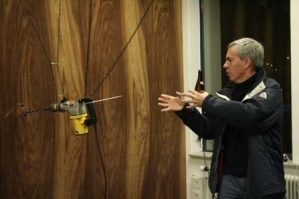 The project emphasizes the importance of this connection to provide a link between people in both spaces and to express this in physical form. This way visitors to the physical space can get a sense of how many online visitors have come and gone and experience their presence as the walls slowly deteriorate. “Calm Technologies 2.0: Visualizing Social Data as an experience in Physical Space“, Michael Hohl, Parsons Journal for Information Mapping, 2009. Thanks to Amy F. for the pic! Thanks to Casey Reas. for the pic! 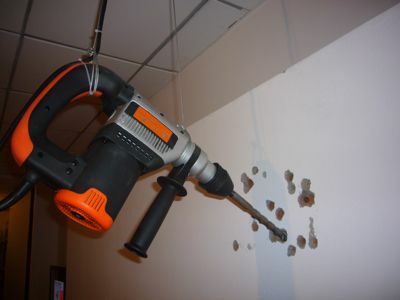 Picture of the jackhammer at Connected! Thanks to Dennis. for the pic! 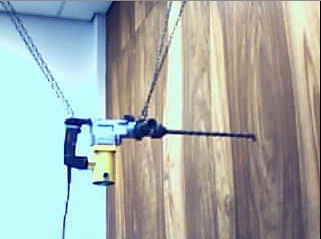 Another picture of the jackhammer at Connected! Screenshot of the damage from AI at Connected!. 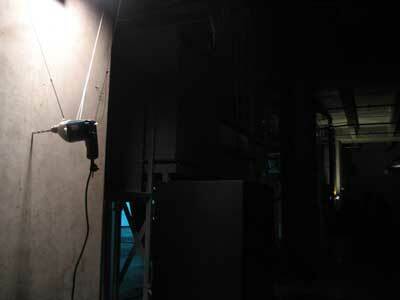 The AI drill at Laboral Center for Art and Industrial Creation – Launch. @ 11/17/07 – 12/24/07, Lima, Peru. 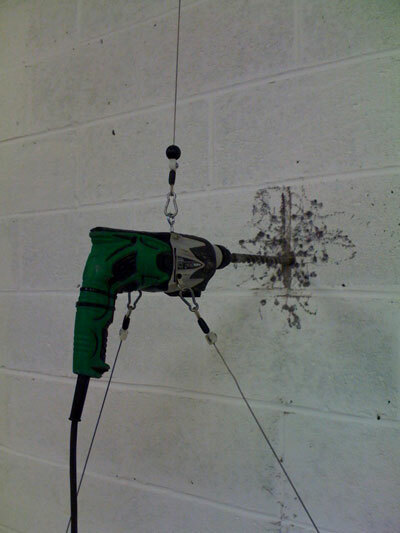 The AI drill @ BLIP! exhibition, Fundacion Telefonica, 11/17/07 – 12/24/07, Lima, Peru. 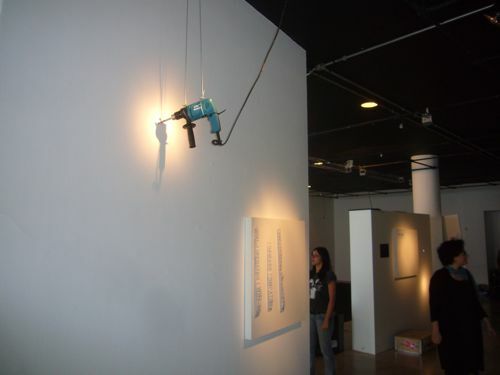 The AI drill @ Art.Mov Exhibition, Belo Horizonte, Brazil, 11/21/08 – 11/25/08, Belo Horizonte, Brazil. 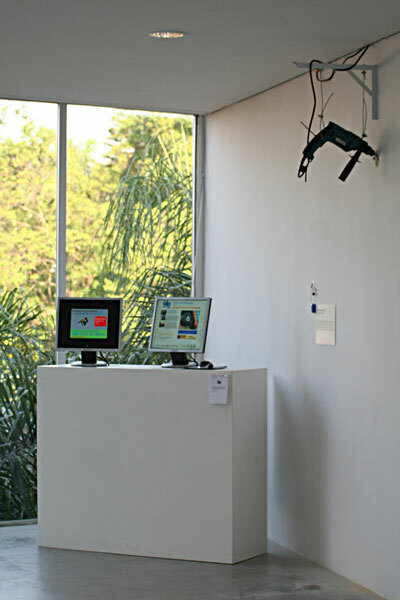 Hit counter @ Art.Mov Exhibition, Belo Horizonte, Brazil, 11/21/08 – 11/25/08, Belo Horizonte, Brazil. Alerting Infrastructure! @ Art.Mov Exhibition, Sao Paulo, Brazil, 11/28/08 – 11/31/08. Alerting Infrastructure! 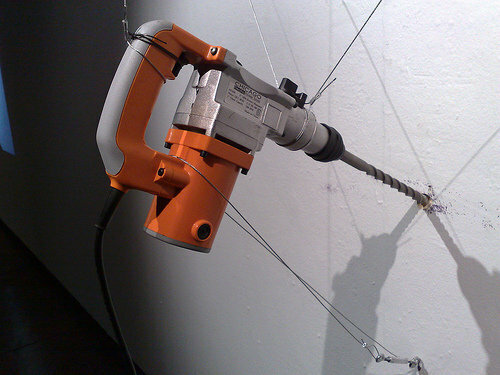 drill and hit counter @ Techformance, ARCO Art Fair, Madrid, Spain 2/11/09 – 2/16/09. 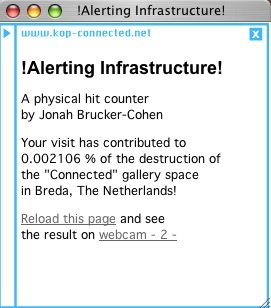 Alerting Infrastructure! drill @ Prospectives 09, University of Reno, Nevada, USA, 11/12-14/2009. Alerting Infrastructure!, NYU Abu Dhabi, Invisible Threads, September 2016.